The Navy’s current assistant deputy chief of naval operations for operations, plans and strategy (N3/N5) has been nominated to take command of U.S. naval forces operating in Europe and Africa, according to a Wednesday release from the Pentagon. Rear Adm. James G. Foggo III, if approved by the Senate, will take command of U.S. 6th Fleet and promoted to vice admiral. A career submariner, Foggo served on USS Sea Devil (SSN-664), USS Mariano G. Vallejo (SSBN-658) and USS Narwhal (SSN-671). He commanded Los Angeles-class attack boat, USS Oklahoma City (SSN-723). Foggo’s other assignments included commander of Submarine Group Eight, commander submarines, Allied Naval Forces South and deputy commander of U.S. 6th Fleet. He is a 1981 graduate of the U.S. Naval Academy, a member of the Council of Foreign Relations and an advisor to the Naval Institute Board of Directors. Foggo was instrumental in the creation of the combined 2007 U.S. Navy, U.S. Marine Corps and U.S. Coast Guard document: A Cooperative Strategy for 21st Century Seapower and its ongoing refresh. If approved, Foggo will replace current 6th Fleet commander, Vice Adm. Philip Davidson. Davidson was tapped to lead U.S. Fleet Forces Command in August. The following is the original Wednesday release from the Department of Defense. 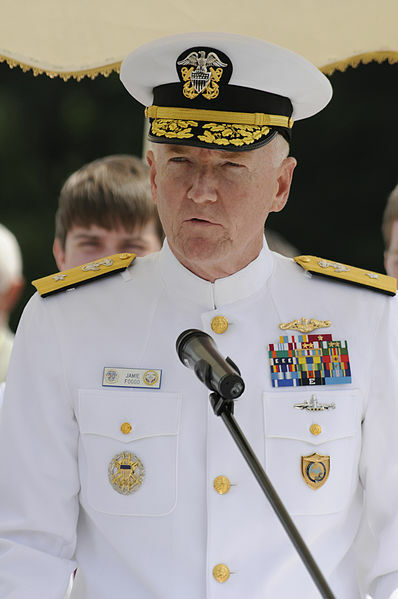 Navy Rear Adm. James G. Foggo III for appointment to the rank of vice admiral and for assignment as commander, Sixth Fleet; commander, Task Force Six; commander, Striking and Support Forces NATO; deputy commander, U.S. Naval Forces Europe; deputy commander, U.S. Naval Forces Africa; and Joint Force Maritime Component Commander Europe, Naples, Italy. Foggo is currently serving as assistant deputy chief of naval operations for operations, plans and strategy, N3/N5, Office of the Chief of Naval Operations, Washington, District of Columbia.